Great Value! 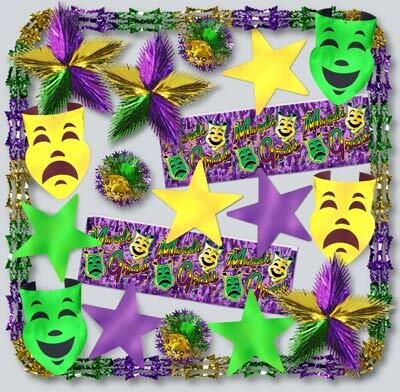 This metallic decorating kit includes the following items: Four 9' Metallic Garlands; Four 18" Comedy & Tragedy Faces; Three 12" Star Balls; Three 24" Leaf Starbursts; Two 4' Flameproof Metallic Mardi Gras Banners; Six 15" Foil Stars. All of these items are in the colors of Mardi Gras: Purple, Green & Gold. Send questions or comments to webmaster@beadsale.com.